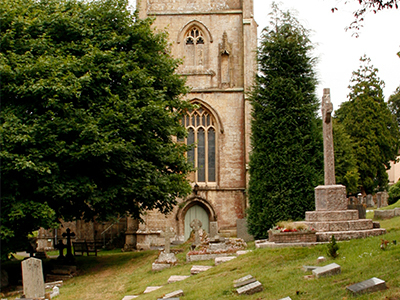 Before the 19th century, the hamlet of Winscombe was centred around the Parish Church of St James the Great. Woodborough, an adjacent hamlet, had a triangular village green and an inn, called The Packhorse, on a site near the position of the present-day Woodborough Inn. Little now remains to be seen of the original green. Then the railway came! An old poster describes how "a procession of The Mayor and Corporation of Axbridge will be formed at the Town Hall, Axbridge". This would be prior to the cutting at "Shutshelve Hill" of "the Valley Railway". Two years later, in 1869, a station had been built in Woodborough, not Winscombe. First named "Woodborough" to avoid confusion with another station of that name in Wiltshire. Ninety-four years later the railway closed to passengers and now even the rails have gone. Today, the two hamlets are one and the resulting village has come to be called Winscombe. However, there are still some remnants and signs from the past. An early improvement was to the old village school. An increase in population had meant that the school had become too small and so a new Junior School with ample playing fields was built. This was closely followed by the addition of an Infants Department. Recently, another fine series of additional buildings has been added. A tour of the premises will surely indicate the pride that these youngsters feel for their educational environment. 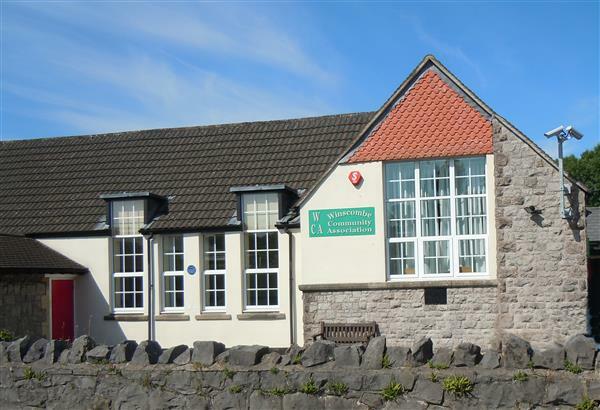 These changes left the original school rooms empty: in 1979 villagers took over and with much effort the building became what is now often called the Winscombe Community Centre and are run extremely efficiently by the Winscombe Community Association. Ideas for futher improvements are being explored. Outdoors there are many sports clubs, including a bowls club in the middle of the village. Soccer, rugby, cricket and tennis are mainly based at or very near the War Memorial Recreation Ground. This is a fine and grassy area bought many years ago by money raised at public events. The deeds are retained, in trust, by the Parish Council. However, over recent years the ground's changing rooms gradually became inadequate. During 2000, with the combined effort of the three clubs and the Parish Council a major loan was obtained to finance a total refurbishment. As a result, appended to what was always a fine pavilion is now a block containing eight team changing rooms, several referees' rooms and a system of showers which can deal adequately with many very muddy players. So that the most skilled of the football clubs teams can mover up a grade in their system of leagues, the Parish Council has accepted the football club's plans to update their section of the ground by surrounding the major pitch with a see-through fence which will enclose the pitch but still allow the play area and the skate park to be seen from the car park. Another group of young people identified the need for a skate park. This, they said, should be away from the centre of the village. Again with the help of the Parish Council and, this time, the War Memorial Recreation Ground Committee, a site was chosen. There were difficulties, including the possibility that surplus water would cause additional problems for the adjacent pitches. So, solutions were sought. 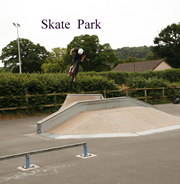 A considerable investment in this so important area was made by the Parish Council to improve the drainage and, after the problem was solved, the skate park was built. Pay it a visit and, if you dare, show the youngsters your skills on a skate board!